1. 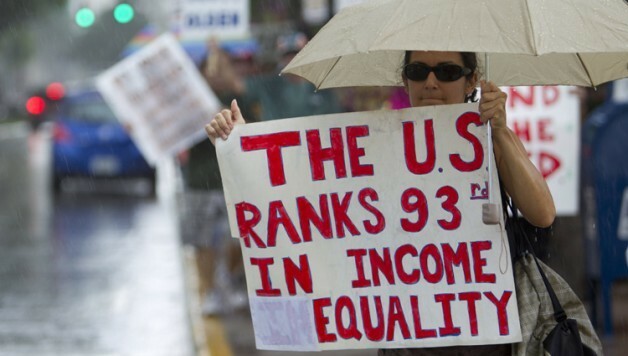 We have record levels of inequality, debt, and poverty, while the 1% makes record profits. Wall Street got bailed out, but where is the relief for working people? 2. Public services are being eroded so big corporations don’t have to pay taxes. In the richest country in the world, we should have fully funded education, healthcare, pensions, jobs, and poverty programs. 3. Big Oil is running roughshod over concerns about climate change. What right does Big Oil have to drill, mine, and frack every last bit of fossil fuel no matter what the cost to communities and future generations? 4. The criminal justice system is broken. The US makes up five percent of the world’s population but has 25 percent of the world’s prison population. Militarized police forces are out of control. Every 28 hours a black person is shot. 5. The vast majority of the media is owned by six corporations. 6. Big business has stacked the two-party system against us. The Republicans are more blatant, but the Democrats are also awash in corporate cash. While they disagree on some things, they ultimately come together to pass pro-corporate, anti-worker legislation like TPP fast track.